Below are common attributes associated to Snow Fountain Weeping Cherry. Become a care taker for Snow Fountain Weeping Cherry! Below are member comments regarding how to plant Snow Fountain Weeping Cherry. No comments have been posted regarding how to plant Snow Fountain Weeping Cherry. Be the first! Do you know how to plant Snow Fountain Weeping Cherry? Below are member comments regarding how to prune Snow Fountain Weeping Cherry. No comments have been posted regarding how to prune Snow Fountain Weeping Cherry. Be the first! Do you know how to prune Snow Fountain Weeping Cherry? Below are member comments regarding how to fertilize Snow Fountain Weeping Cherry. No comments have been posted regarding how to fertilize Snow Fountain Weeping Cherry. Be the first! Do you know how to fertlize and water Snow Fountain Weeping Cherry? Below are member comments regarding how to deal with Snow Fountain Weeping Cherry's pests and problems. No comments have been posted regarding how to deal with Snow Fountain Weeping Cherry's pests and problems. Be the first! Do you know how to deal with pests and problems with Snow Fountain Weeping Cherry? Looking for Snow Fountain Weeping Cherry? 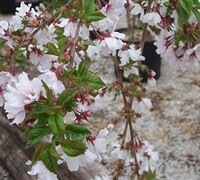 Snow Fountain Flowering Cherry is a narrow-growing variety suitable for smaller, more confined spaces. Plant in well-drained soils and sun or partial shade. Snow Fountain Weeping Cherry doesn't require pruning. You can snip a stray branch here or there to maintain form. Fertilize Snow Fountain Flowering Cherry after flowering in spring with a well-balanced shrub and tree type fertilizer. Alternatively, you can feed with a natural or organic plant food.